Volant Throttle Body Spacers are designed to be used either with your factory air intake system or in conjunction with a Volant Cold Air Intake System. Throttle body spacers improve horsepower, torque, and improve fuel efficiency by stabilizing air flow and allowing a greater amount of air (because of the increased space) into your engine, allowing it to work easier because the air is more readily available in an increased volume. Manufactured from Glass-Filled Nylon Composite, the Vortice Spacer is strong and lightweight. 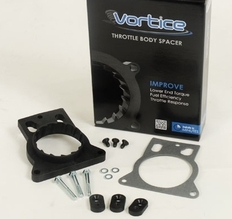 It�s unique Vortex Design delivers equal or better performance than other throttle body spacers costing twice as much; making the Vortice a better choice for your truck, and your wallet.